Buying a crib in today’s world can be a daunting task. Between recalls and other infant safety issues, you can no longer just walk into a store, pick out whatever you like, and make your purchase without any worries. The first crib we ever purchased we thought would also be our last. Little did we know it would become a concern for safety as it was recalled, which required adjustments be made to the crib. Then, after three boys, it was trashed. When we later found out we were expecting another child, we decided it was time to invest in a better crib, something that we would not safety concerns with later on. 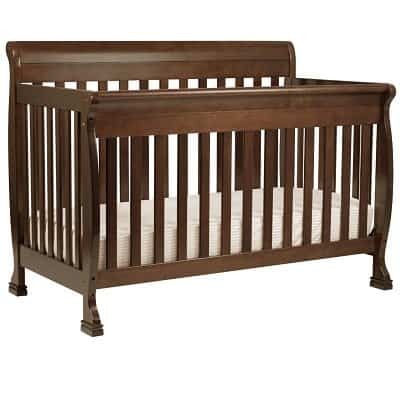 I really wanted a timeless high-end looking crib without the high-end price tag. It was a must that it be finished in non-toxic, lead-free paint and compliant with all ASTM international and U.S. CPSC safety standards. 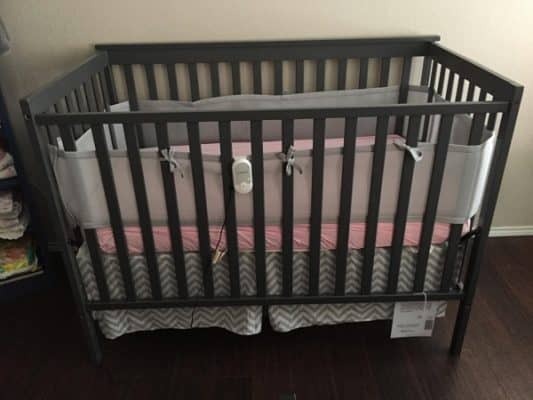 We also wanted a crib that would later have the option be changed into a toddler bed and/or full-size bed so we could get as much use out of our purchase as possible. Consider how long you want your crib to last. Is it for one last child or are you just starting your family and want it to last through all your kids? This can help you decide on design, material, and color. Trendy colors are just that: trendy. While they might look great and be popular now, you might not like them anymore once you get to your third or fourth child. That is why the length of time you plan to keep and use the crib is important, but the most important factors are safety and quality. When looking at a crib, read about what safety certifications it has and make sure it is painted in non-toxic lead-free paint. Babies and toddlers often will put their months on everything! This includes the side rails of their cribs. I can’t even begin to describe how many teeth marks our first crib had once we were done with it. In my own experience, the higher the quality the less likely you are to have safety issues later on. Does quality always cost more money? Not always. This is why I find reading reviews helpful. I often like to find products online that I like, read their reviews, and then go find out if they are available at any local stores around me where I can actually view the product in person before making my purchase. 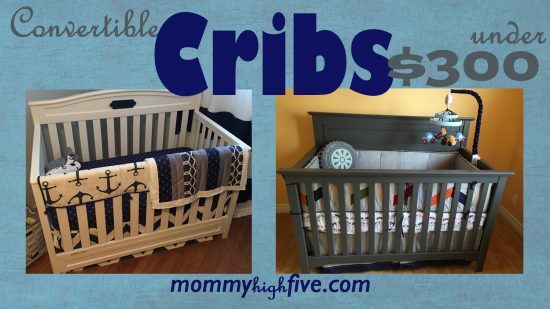 But with my crib, I could not find anyone who had the actual cribs I liked in-house, so I relied heavily on reviews. 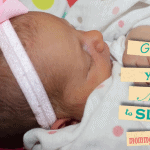 At first, I leaned toward a high back gray crib. Gray is currently trendy, but it is also a color that can go with almost everything. However, I struggled to find one that had the high-end design, didn’t break the bank, and had good reviews. Being a planner, I went back and forth for a couple of months searching for the right crib. When purchasing our first crib (12+ years ago), my husband and I literally walked into a store, picked out a crib in a few minutes, and walked out. 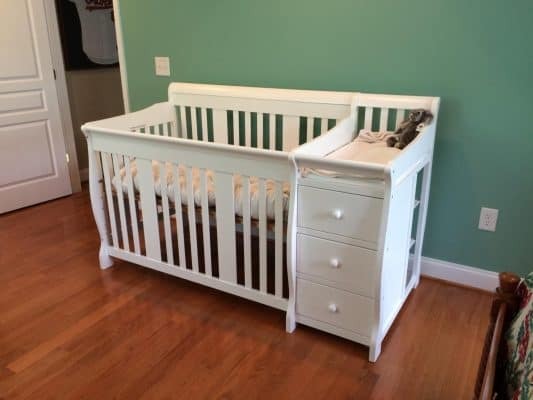 This time, we were much pickier after our experience with safety recalls and realizing our crib was not designed to be taken apart and reassembled multiple times. Here’s a crib we looked at right around $200. One of the reasons I like the Kalani is that it’s a fixed side lower profile crib, which makes it easier to reach your baby. It has seven colors to choose from including; cherry, chestnut, ebony, espresso, grey, honey oak, and white. An optional three drawer changing table is available to purchase separately and includes the same matching colors. I love having coordinating furniture! Keep in mind that with any budget crib it’s likely to scratch easily. So, lighter colors may be preferable here. In addition, the changing table drawers are meant for a baby and not for a toddler, so ultimately it may not last as long as the crib if you plan on converting it to a full-size bed. The Kalani Meets ASTM international and U.S. CPSC safety standards and is JPMA certified. It is finished in non-toxic lead-free paint, which is a must! Four level mattress supports make it so you can raise and then lower the mattress as your baby grows. 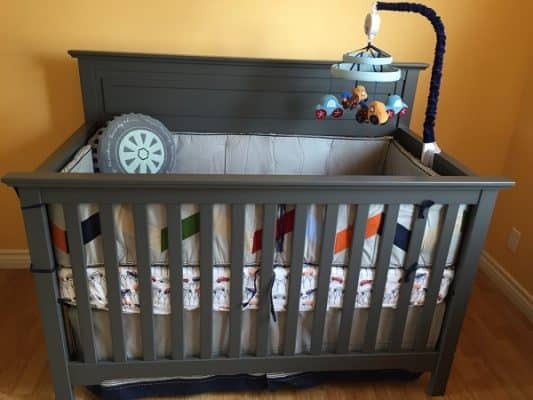 This crib has a very similar solid wood curvy design to the DaVinci Kalani, but it has a built in changing table on the side, saving you some money and possible space. For those who are curious, the changing table can be removed and used as a nightstand when converting to a toddler or full-size bed. The Portofino comes in three finishes: espresso, white, and cherry, and it has three adjustable positions for when your baby starts to grow. This is common in all cribs we looked at with some cribs, like the Davinci models, having four. It also converts from a crib to a toddler bed, daybed, and full-size bed. The Stork Craft Portofino meets basic safety standards but does not have the same level of ratings and certification as some other cribs. In addition, I’ve heard that the espresso paint finish can be quite strong smelling. So, be sure to purchase it and let it air out before letting your baby sleep in it. 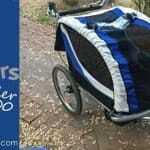 Overall, the Portofino is a good value at around $300, as it comes with a changing table and is sturdy but does have some potential drawbacks. If you’re looking for a good solid and cheap option, take a look at the Delta Emery. At just under $200, it’s one of the cheaper options on this list while still retaining many of the features. This crib has a classic curved back design that comes in both white and dark chocolate finishes. The Emery comes in white and dark chocolate, offers fixed sides, and has three mattress positions. It’s advertised as being a toddler bed, toddler daybed, and full-size bed. While the crib does support daybed conversion and includes a daybed rail, it doesn’t actually come with the toddler guardrail and crib conversion rails so you’ll need to plan ahead if you want to use it for that. 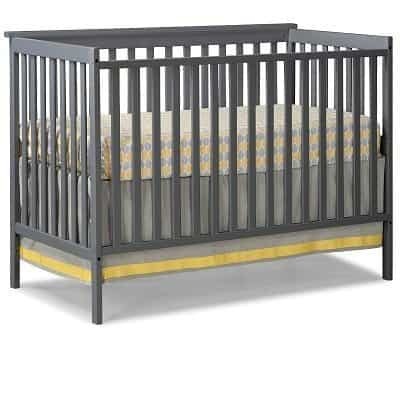 This is a great crib for those wanting a more classic crib with that popular modern simple flair. It is also easy to assemble, and with its simple design, it fits easily into any bedroom design. The Stork Craft Sheffield offers a timeless but sleek design that looks fantastic. This fixed sides solid wood crib offered in non-toxic white, gray, and espresso finishes. One potential downside to this crib is that there are only two adjustment heights. With added materials, the Sheffield can be transformed from a crib to full-size bed. Overall, you get a lot for under $150 with the Sheffield. The crib is solid and looks great too. Then we found the one! 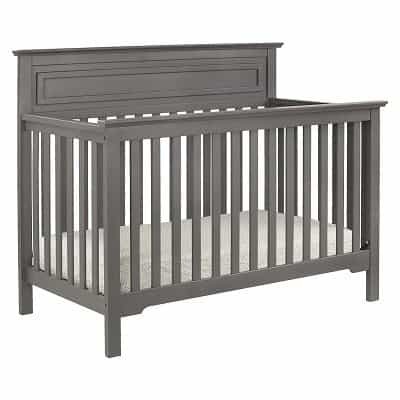 This crib has a more square classic high-end design I was looking for, came in slate gray, white, espresso, and walnut (classic colors) and had GREAT reviews on multiple sites like Kohls and Amazon. It also offers coordinating changing table and or dresser options. 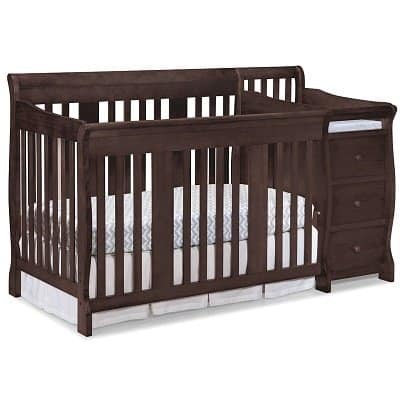 While this crib was offered on multiple sites, we decided to purchase the crib in on Amazon, as it was the cheapest and I got FREE shipping! 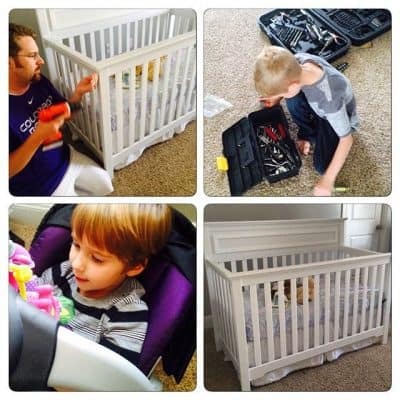 Two days later the crib arrived and my husband had it put together quickly and easily. It looks amazing! The solid wood design looks even better in person than in the online stock photos. 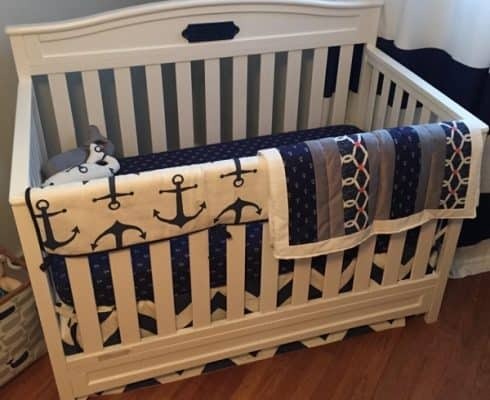 With sticking with a classic design it is a crib that is timeless and will work for either a boy or a girl, even though we were planning to use it for a girl. It is very sturdy and does not shake. 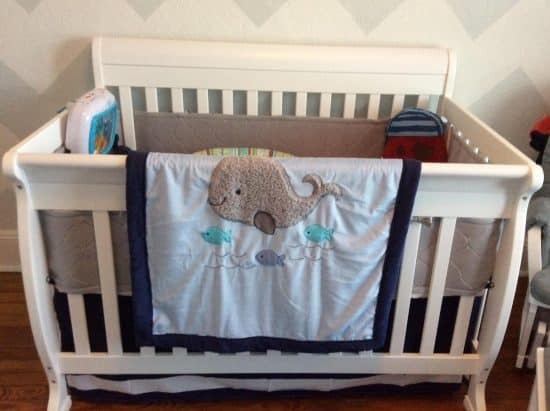 Everyone who has seen the crib in-person has asked where they too can get it and have been shocked at the low price. Now over a year later, we are surprisingly about to have another baby and this time a boy! 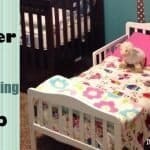 We are so happy we purchased this crib that worked with our girl bedding and now will work great for another boy as well. You never know what life is going to send your way. That is why for us it was so important to purchase something that would last and work for both a boy or a girl while still being non-toxic and stylish; you should love what you invest your money in.